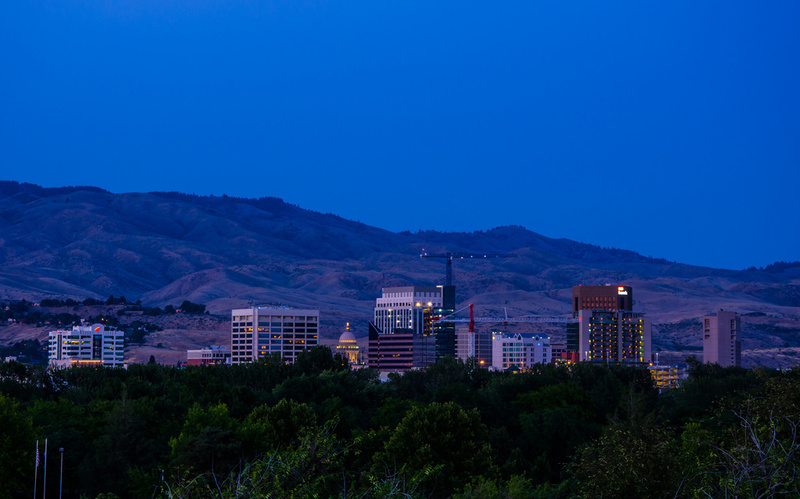 After seeing so many beautiful nighttime photos of city skylines on this site, I wanted to try to capture a night shot of my town, Boise, Idaho. While it surely can't compare with the amazing skylines of NYC, London, or Sydney... it's home and I love it here. This is a lovely start, Lisa! I think if you waited a bit longer into the blue hour, you might get more lit up buildings against that great blue sky. @archaeofrog Thanks Katie. I know what you mean. I do have some darker "blue hour" ones, but just liked this version for a bit more detail in the foothills in the background and trees in the foreground. @pflaume I totally get that too. I like the colours in this Lisa and the fact that the foreground and foothills have detail in them. Is that some sort of memorial with the dome in the centre, it looks like an interesting building. @elaine55 Thank you, Elaine. Yes, the little dome is the state capitol building. I just love those hills in the background! It may not have all the light of NYC but it has that beautiful landscape instead. Nice night shot! Lovely shot. I love the mountains. Boise is a beautiful city. Beautiful. I love seeing the different s from all over! A very lovely city scape....I love the light of the city light in the sky as well. Wonderfully composed! I love this scene... a Fav for me. It is super sharp and the colors are awesome! It's lovely. A friend's daughter has a swimming scholarship to Boise State. She speaks very highly of the city!! Lovely colors. I also love the buildings against the bare mountains. @kwind That is so cool, Kim! A small world... my sons participate in the BSU youth swim program which is coached by BSU swimmers. It is home that is all matters. It is beautiful anyway and made me curious about what people are dreaming (awake or not) at this moment. I think it is a very pretty city- it sort of reminds me of Mont Pelier Vermont but with a few more high rises. Lovely colors. Such interesting transitions between strata (is the right word to use I wonder?--just felt like it-- :)). I love night shots and have almost no experience. I hope to try some this fall when school starts. Perfect time of evening to get some detail in everything. I much prefer Boise, or other smaller cities, over the gigantic metropolitan areas. The small populaton of our state is just perfect for living well. A fascinating skyline with those hills behind as a backdrop. Looks really good viewed large, lots of detail and great sky. What is the dome topped building? Love the colors. Those mountains are amazing! Looks amazing in large, beautiful blue tones and great clarity, very good night shot. Boise, Idaho looks very idyllic to me, I too live in a smaller city and would not want to live in those begger cities. Beautiful shot with the mountains in the background. Lovely! I like that you can still see some of the surrounding details! A great night shot I love the blues setting off the buildings. Nice skyline. I like it with the trees in the foreground and the hills in the background. It makes a very nice scene! It's beautiful. I traveled right past your city this summer on our way to our daughter's graduation in Oregon. So close and yet so far . . .
Wow! Gorgeous! Love the layers and those hills look beautiful in that light. Must-see on large view. Fav. The town looks like it is nestled in among the forest and hills - what a great place to live. Gorgeous shot. Great skyline shot, I'm just too lazy to get out and take mine!! Wonderful shot! You captured it at just the right time. Fantastic capture lisa...i love how the mountain separates the sky from the town.... fav! You've captured these shades of blue so well. I love the skyline against that big big sky, just beautiful. Rich and gorgeous blues. love the blue tones! magnificent capture! I love the blue tones too! great shot!